Why do I need a four point inspection? Insurance companies have become increasingly reluctant to issue Homeowner Insurance Policies on older homes (usually 25 years old or more). Their common concern is that there may be conditions in an older home that could become a liability to them. For instance; a home with a roof nearing the end of its reliable service life may fail while under the policy and the homeowner may seek reimbursement from their insurance company for damages to the home or its contents. Similar concerns extend to the condition of the HVAC, electrical and plumbing systems in an older home. If these elements are in poor condition, in need of being updated or replaced or were improperly installed, they may fail and cause fire or water damage to a home. This is why you need to get a 4 Point Inspection. 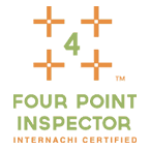 There is no industry-wide standard form for a Four Point Inspection. Some insurance companies provide their own forms; however, most insurance companies will accept forms from companies that perform home inspections provided that they are filled out by qualified individuals. Inside & Out Property Inspectors has developed a form that meets the requirements of most insurance companies in South Florida. They are signed by a licensed Professional Engineer. Insurance companies want these forms filled out by certain qualified individuals such as a licensed Professional Engineer, Electrician, General or Roofing Contractor. The insurance companies do not want large reports that contain other information. They want only specific information about the HVAC, plumbing, electrical system and roof in a short one or two page signed document. Before you pay for a home inspection you should research with your insurance company if they will require a Four Point Inspection Report. You can end up paying twice for much of the same service and information gathering. Because of the size of a Standard Home Inspection Report from Inside & Out Property Inspectors, it is not in a format that your insurance company needs. You should check with your insurance company in advance to see if our Four Point Inspection form will satisfy their requirements. We cannot guarantee they will accept our form and additional charges will apply if we have to use their form. Contact Inside & Out Property Inspectors Inc. today to schedule your home inspection with an InterNACHI Certified Professional Inspector in Central Florida. Offering a discount of $20 off to active military, veterans, and first-responders.